Every company in California with 5 or more employees must provide sexual harassment prevention training within 2019. 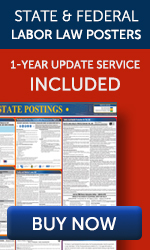 We will be presenting live webinars each month that are compliant with California's AB1825 and SB1343. This training is very interactive and employees will have ample time to ask questions. What's great is that webinars allow your employees to actually talk with the trainer in the comfort of their office or home. 1. Click on the date below for the webinar you want to attend and complete the registration form for each attendee. 2. 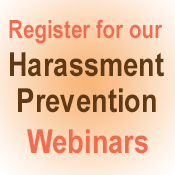 Pay the appropriate registration fee prior to the webinar. Use PayPal or mail a check payable to HR Jungle (2358 University Avenue, #2223, San Diego CA 92104). Clients may request to be invoiced. Email us to request a webinar for your company on your schedule or if you have any questions. Not Interested in Webinar Training? In-Person Training — Having someone provide training in person is often the first choice for companies. A good trainer can make it easier to keep everyone's attention. The biggest downsides include the higher cost, a large enough room, and the ability to get everyone who needs the training to attend without distractions. Too often, a few people are unable to attend and you still need a secondary method to get them trained. Online Training — This the method used most often because you get to pick the time you do the training so it's easy to find the time. However, people get bored and often don't learn or remember as much of the training as needed to avoid and prevent harassment. Live Webinars — Since we are offering live webinars we, of course, really like this option. We feel it's a good combination of very personal training and the convenience of sitting at your computer while training. The live webinars allow your employees to ask questions throughout, and after, the training. If you prefer to have in-person or online training instead of our webinar training, let us know. We will be happy to direct you to our favorite resources. Disclaimer: Please note these webinars do not constitute legal advice. The webinars are designed to give you a general understanding of the law. Please consult with an employment law attorney if you are seeking legal advice. if you have questions about this training!